Racing takes years to master. Only the best and most skilled drivers can advance to the highest levels of motorsport. The track isn’t a place for fools. Unless of course we’re talking about the gentleman racer series known as the Ferrari Challenge, where any monied jackass can buy their way in and then crash into everything like real life Mario Kart for one-percenters. Don’t believe me? Watch this highlight reel from Ferrari Challenge Europe at the Mugello Circuit, a race held in May that’s just now making its way to YouTube. This is the some of the worst racing I have ever seen. I’m not even mad though. This is actually incredible. Pick a crash, any crash. How does this happen and keep happening? Do they test their drivers at all, or just have them deposit a check at the gate and they’re good? Why is it so satisfying to watch? Now, the Good Lord knows I’m not one to talk about on-track mishaps; I’ve had my share! But if I had unlimited-ish funds like the Ferrari Challenge guys do, I’d probably spend a hell of a lot more on driver training and racing schools before I ever set foot in a race-prepped 458 Italia. Then again, that would mean delaying gratification, and when you’re rich you don’t have to do that. Know what? 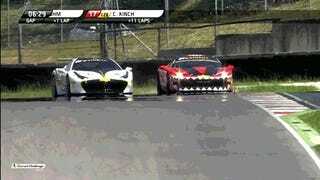 You keep on doing you, drivers of Ferrari Challenge! The videos that come from this series are too amazing for me to really condemn you all that much. You have the hardest-working safety car drivers in the business, if nothing else.